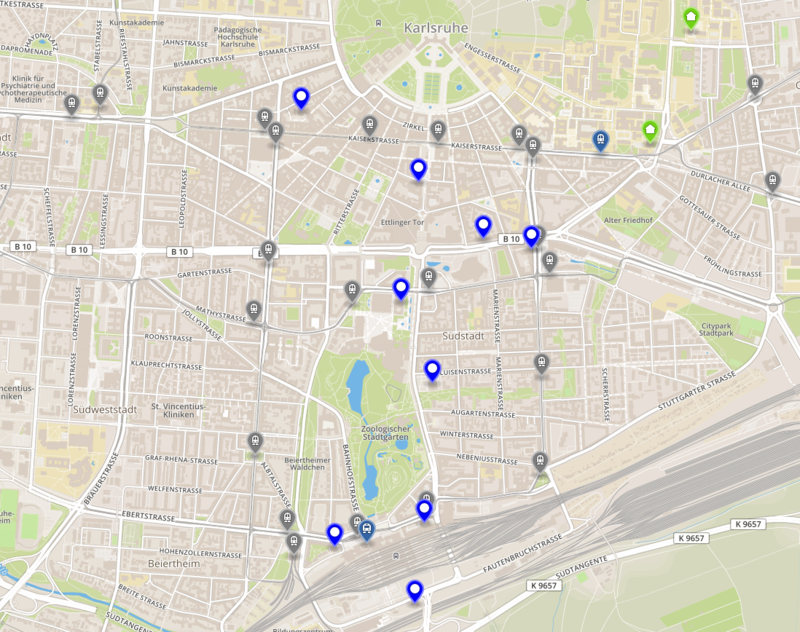 It is centrally located between Karlsruhe main station and the venue at KIT (OpenStreetMap). The venue is quite close so that you can easily walk the distance. The public transport stop (Rüppurrer Tor) is just in front of the hotel. Tram lines number 2 and 5, as well as trains S4 and S41 take you the two stops to the venue (Durlacher Tor / KIT Campus Süd). Tram lines 2, S1, S11, S4, S41are going from the train station to the hotel. See the public transport page for more information about transportation in Karlsruhe. Location of the different hotels marked as dark blue and a selection of important tram stops in grey. The venue is marked in green.